The Beijing Olympic Games are rapidly approaching. One day in the near future the Olympic Torch will be lit, and some of the finest athletes in the world will compete for their countries. Sadly, there’s no Olympic category for “speed computer assembly” or “fastest software coding”. Us geeks are typically left in the dark when it comes to athletic prowess, other than that one year we were on the track team in high school. But never underestimate the mind of a geek. Just because we don’t have the proper coordination or balance for athletic competition doesn’t mean our involvement in the Olympics is ruled out. I mean, for one, you’ve got to imagine the judges are major nerds. If you need more proof about geek involvement, just check out this amazing Lego structure called Sports City, a total recreation of some of the venues which we’ll see in Beijing. HKLUG erected this awesome Lego sculpture which is both impressively realistic and pretty massive in size. 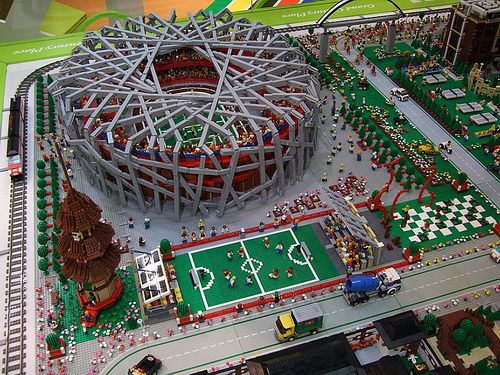 The replica of the National Stadium itself took over 100 hours to complete, measuring about 40″ x 48″. Also included in the sculpture is the National Aquatics Center (”Swimming Cube”), and Olympic Village. 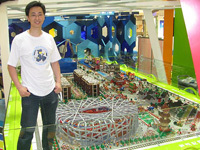 If you’re lucky enough to be in Hong Kong within the next month or so, you can check out the Lego Sports City yourself at Grand Century Place between now and August 31, 2008. Check out the HKLUG website for much more information about this massive Lego project.